Example of the Image Comparison Tool being used in Side-by-Side mode to compare Gloucester Harbor, 1852 (inv. 38) with the infrared image. Up to four images can be compared simultaneously. 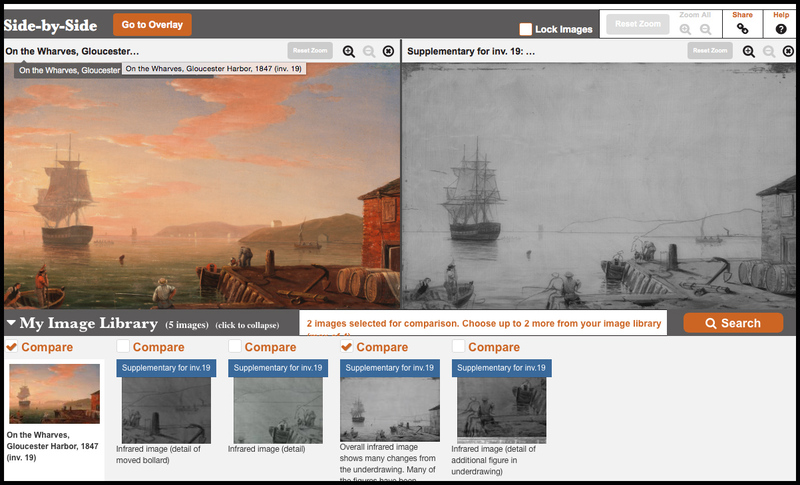 Fitz Henry Lane Online is pleased to announce the addition of the Image Comparison Tool, an innovative tool created specifically for this project. The tool allows users to compare images, view them side-by-side, resize them, change the contrast, and overlay one on another. This tool is particularly useful in comparing Lane's paintings to his preparatory drawings, infrared images, and series of related works. Explore the Image Comparison Tool. Citation: "Fitz Henry Lane Online Adds Image Comparison Tool." Fitz Henry Lane Online. Cape Ann Museum. http://fitzhenrylaneonline.org/page/news.php?id=4 (accessed April 23, 2019).